Other Makers : Welcome to the VintageSaws.com Online Store! Here you will find saws made by makers other than Disston. I have to admit, I have a preference for Disston saws. Maybe it is because they were the biggest, maybe because they were the most innovative and maybe it's because I was born in Pennsylvania where they were made. 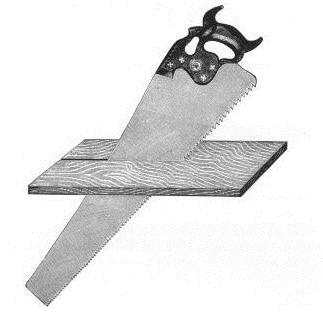 It also doesn't hurt that the vast majority of saws found in the wild are made by Disston. In any case, there were other makers who made saws every bit as functional and as good as those made by Disston. People sometime refer to the big "3" which included Disston, Atkins and Simonds. While neither Atkins or Simonds made saws as long as Disston, they did make a great product. There are also lots of smaller firms which also were competition ...especially in the early years before 1900. These include Richardson, Woodrough and McParlin, Peace, Bishop and several others. Like other saws for sale on the site, these saws are sold sharp, set and ready to cut. Buy with confidence, if you see it here, it will get the job done.